Summary: World War II veteran and former POW Pete Hallam returns to Devon, the preparatory school of his youth, to teach history. He hopes the peaceful atmosphere will help him move past the horror and the pain he has experienced. Devon, however, is not the idyllic place of his memories. A generation of schoolboys grew up with one goal in mind: to join the army after graduation and serve their country. The end of the war leaves them disoriented and, with no common enemy to give their lives direction, they begin to turn upon each other. A companion book to A Separate Peace. Review: Peace Breaks Out often lies, perhaps unjustly, in the shadow of its predecessor A Separate Peace. It is true that readers miss the sensitive rendering of an adolescent trying to find his own identity and the subtlety of the interactions between Gene and Phineas. Instead, they get characters who border on stereotypes—the good-natured but not too intelligent athlete, the misunderstood and scheming genius, the steady war hero, and the German Nazi sympathizer. However, though the story speaks to the book that came before, it does not try to imitate that book and thus should not be judged on the same merits. The broad characterization is not a mistake, but a calculated technique that enables the author to study the effects of peace on a lost generation. These boys have truly lost a sense of their individual identities in their desire to assimilate themselves to the war effort and to emulate the boys who graduated before them. Their portrayal helps form a commentary that encompasses not only adolescent boys but also human nature. Knowles does not shy from exploring the dark side of the human heart and Peace Breaks Out delves even deeper than its companion book. Though some of the boys lash out in fear or confusion, their thoughts as incoherent and their feelings as unacknowledged as Gene’s were, they ultimately act a predetermined role in a play entirely staged by one evil mastermind. The focus has shifted from the darkness inside us all and the need to confront it to the idea that others can utilize that darkness, as well. Frighteningly, Knowles reminds readers that such manipulators do not spring upon the earth fully-formed. The adolescent boy professors shake their heads over can grow up to be the next dictator. The book ends on a somber and haunting note as readers seem to face the realization that they are practically powerless from stopping such men until it is too late. In keeping with the themes, the book itself has a quiet and thoughtful air almost bordering on solemnity. Knowles wastes no words, but writes with simple grace. The style captures the peace that the rural location of the school seems to promise even as the students create turmoil. The contrast between the style and the sense of impending doom that hangs over the plot mirrors Pete Hallam’s experience as he returns to his alma mater seeking respite from a world he found all too real. This immersion brings the book even closer to the reality of the readers, allowing them to participate and apply the themes to their own lives. The general characterization helps this process; Wexford, for example, is no longer solely himself, but also personification of cleverness and manipulation. Readers are invited to think about Wexford-like qualities found in the world around them. 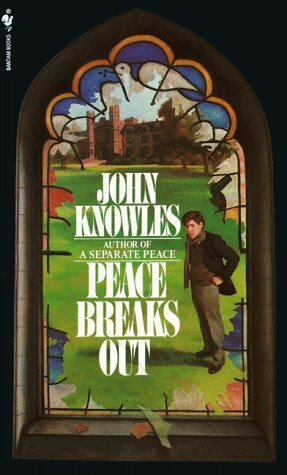 The reputation of Peace Breaks Out has long suffered from comparison with A Separate Peace. Both books, however, are valuable in their own way. Peace Breaks Out explores the often overlooked effects of war on those boys who never made it to the front lines and does so with insight and even compassion. If readers keep in mind that the story is meant to be a different experience from A Separate Peace, they may find themselves pleasantly surprised by story’s quiet strength.